Running at altitude can be a challenge especially when you live at sea level. Altitude begins to impact running performance for most people, who live at or near sea level 0-1600m ft (approx 0 -500 m), at about 5,000 ft. (approx 1500 m). At that point, you can expect about a 1% reduction in performance for every 3500 ft (approx 1000 m). Altitude sickness becomes noticeable at around 6500 ft (approx 2000 m) and it becomes compelling at 13000- 16000 ft (approx 4-5000 m). If you’re above 16000 ft (approx 5000 m) you can’t really become acclimatized. Near sea level is 0- 1600 ft ( approx 0-500 m). Low altitude is defined as 1600- 6500 ft ( approx 500-2000 m) and you may have minor impairments. Moderate altitude 6500- 9800 ft (2-3000 m) is where you’re really going to notice mountain sickness if you at low altitude or near sea level. Acclimatization becomes important at this level. High altitude is considered 9800-18000 ft(approx 3-5500 m) and even those who live at the high end of low or the low end of moderate are going to start to feel the effects. At high altitude mountain sickness and acclimatization become critically important. Above 18000 ft (approx 5500 m) is considered extreme altitude and the longer the exposure the more your performance declines and you can’t really acclimatize. So, what’s going on? There is lower oxygen levels at higher altitude. Oxygen concentration the air is at about 21%, even altitude. The problem is there is less gas overall, which results in the lower pressure and difficulty in breathing. This translates into less oxygen in your blood so your muscles are not going to be able to perform at their optimal level. This lower pressure does have one benefit. There’s less drag from air pressure because the air is not as dense. This is particularly apparent when you are moving fast. However, this is not going to impact the majority of ultrarunners because of the duration and speed at which we run. When does acclimatization occur? Most of the respiratory adaptation occurs within 5-6 days and then will continue to adapt. An increases in altitude also increases amount of adrenaline and noradrenaline, which makes the heart beat a little faster increasing the amount of lactate released. Adapting to this situation occurs mostly within 2-3 days days and then will improve at a slower pace. Once you’ve been at altitude for 1-2 weeks your body begins to produce more red blood cells and that gradually increases until about 3-4 weeks. Another change that occurs when you move to higher altitude is that you burn more carbohydrate and less fats. It takes 2-3 weeks for your body to return to its prior “normal” for burning these two sources of fuel. This happens around 13,000-16,000 ft (4-5000 m). Does training at altitude change your adaptation? Training at altitude can help you adapt quicker because you’re stressing your system, but this only works if you live at altitude. However, a short 30-60 minute run isn’t going to do much. Your want to train at a lower intensity so you can sustain the effort for the longer duration. Live high, train anywhere is the standard recommendation. You get the most benefit when you can train high intensity at lower altitude and long slow distance at high altitude. What if you don’t live at altitude, what can you do? Altitude tents. You have to live in them long enough. You need to be in the altitude tent for 12-16 hours a day. If you’re just sleeping in it, it’s not going to be enough to give you a noticeable response. The other factor is you can’t just sleep in their or lay around. You need to be moving around. Altitude masks or other such devices do not work. What they do is exercise your lungs, which can improve your breathing economy. If you’re racing high and live low, when should you arrive to a race? Ideally you’ll arrive 3-5 days before race day, if the race is around 5000 ft (1500 m). For moderate altitude 6500- 9800 ft (2-3000 m), it’s about one to two weeks. And for high altitude above 10,000 ft(3000 m) you’ll need at least two weeks. What to do if you can’t arrive 3-5 days before a race or whatever time? The greatest loss to your performance occurs as soon as you arrive at altitude. 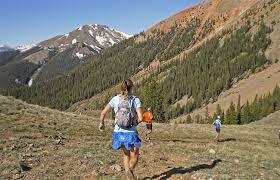 If you get there the day before the race, you may have some altitude sickness, which improves after 2-3 days. Basically, if you can’t get there 3 days before the race be ready to deal with some issues because of the altitude. One thing you need to keep in mind is that the altitude is going to change your pace and you shouldn’t push harder to make up for it. How quickly do you loose your acclimatization? After ten days to two weeks, you’re going to feel some of that loss, but five days doesn’t cause much of a loss. One month of living low and you can’t even tell that the person was acclimatized to high altitude. I think we’ve all heard about the benefits of living high and then running at sea level. You do feel great, but may be a little disappointed when you go out for your first run because although you have the benefits of the higher red blood cells, you are also moving through air that is more dense then you are use to running through. Basically, that makes you slow your pace. High or low, your body needs time to adjust. As does your brain, so you don’t go out pushing hard and not doing a darn bit of good.